Stoker Elwick and an ‘oppo’ in ‘half blues’ c.1945. Stoker Ted Elwick was the Engineer Officer’s Writer and it is likely that his ‘oppo’ (short for ‘opposite number’, i.e. someone you work closely with and/or ‘run ashore’ with) was also a member of the Stokers’ Mess and, therefore, a Stoker, too. The Engineer Officer’s Writer, of which there would be only one on board, was a Stoker junior rating who had completed a short secretarial course and it was he who maintained the records, registers, books and files related to the ship’s machinery; he would only rarely keep watches with other stokers in the machinery spaces ‘below’. 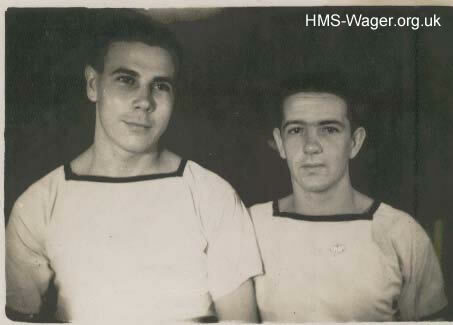 ‘Half blues’ was an informal wearing of blue uniform, just the traditional ‘white front’ seen in the photograph, worn with blue serge bell-bottom trousers (and the traditional five or seven ‘ladder’ creases, the number depending on a man’s height); the uniform would be worn in the evening on board, although more casual (‘pirate’) rig of one’s own choosing was often worn in smaller ships working ‘destroyer routine’ and, as no doubt here, the rig (uniform) would also be worn ashore in the evening in warm and tropical climates. The photograph may well have been taken during a ‘run ashore’ in Sydney or Auckland in the summer of 1945.